The young ones tumbled around in the middle of the circle of adults seemingly without any care. The adults were watching silently, some toward the children and some toward the horizon. The regular cries of hunger were soothed by the watching adults as they could. But, it had been a while since any of them had eaten. “When we move and hunt?” was the question on everyone’s mind, but the Leader wasn’t giving an answer. He had rested in the shade most of the day, but now he stirred to take his watch during the night with some of the others. He stretched his long, feline body as he stood up from his rest. Scar Mate softly growled and fixed her wolfen eyes on Leader. “And, if my Pup starves?” she asked. The others made small noises of agreement. “Soon. All want to eat, but must be safe.” Leader walked away, working out the last bits of sleep from his body. Scar licked the Pup quickly and moved to take his position inside the circle for the night. The green ones had been cruel in killing all of Pup’s siblings, and Scar worried about him being alone. He knew that Mate was conflicted between safety and food. The parents were starting to grab their young ones and get them ready for sleep. A few young ones howled in weak protested, but eventually all settled down into a quiet slumber. Shadow performed her nightly ritual of circling the sleeping area seven times then twitching her bushy red tail before laying down; she claimed it made her, and by extension the group, harder to find in the darkness. As the last bits of light faded from the sky, the watchers turned all their senses to the surroundings. 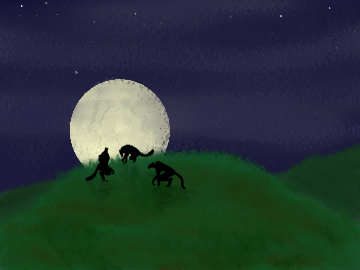 The light of the moons was bright this night, so all movement on the plains was easy to spot with their watchful eyes. A gentle breeze brought the various scents of the area to them, letting them know that nothing unknown was upwind. In the distance, sensitive ears picked up the rolling of the waves in addition to the typical noises in the area. After many hours of quiet, something crashed through the brush near the group. Leader’s ears pricked up and he glanced that direction. The old wolfen one, Growl, stood up and took a slow breath to focus himself. He looked toward Leader, who nodded and motioned toward the sound. Growl crouched down and moved silently toward the brush and blended into the night. With a quick sniff of the air, Growl caught a familiar scent that he couldn’t quite place. It wasn’t one of the pack, or an animal, but something he had scented before…. As he crawled around the bush, he saw it: a creature putting rocks together in a pile. He watched quietly for a short while. As the figure stood up, Growl coiled his muscles and got ready to pounce. The figured looked up and opened its eyes wide as it recognized the sleek form before it. The scent of surprise hung in the air. They both stood there for a while, both keeping careful eyes on the other and tensed up to counter any sudden move. It was the bare one that took the first careful step backwards, then another, and some gentle sounds. It held its hands in front of it, protecting itself from any sudden moves. Growl took a few steps backward and relaxed a bit. The other figure slowly got down to the ground, touched its head briefly to the ground, then crawled backward slowly. It was out of sight before Growl turned around and headed back to the group. Growl nodded as he took his place back in the circle and turned his eyes outward. The rest of the night passed quietly as Leader was left with his thoughts. As the sun rose, the group started stirring. Sleepy adults were waking up and preparing to take their place on the watch. Leader decided it was time to share the news. Small noises of joy echoed through the pack as relief washed over them. Finally, they would hunt!